Melanie and Carlos Jones will co-facilitate the National Dance Education Organization’s second special conference topic on jazz dance. The conference will include classes, jam sessions, panel discussions, research presentations, and screenings of the films Transmission: Roots to Branches and Everything Remains Raw. Registration is now open at ndeo.org/jazz2019. Jazz Is... Dance Project is off to a great start to 2019, with a choreography residency at University of Wisconsin-Milwaukee, Melanie’s site visit to Decidedly Jazz Danceworks headquarters in Calgary, Alberta, Canada, and a follow up interview with the creative team from Transmission, the upcoming documentary on jazz dance. Stay tuned for details about each of these projects in the coming months. Melanie participated in Urban Bush Women’s 2nd annual Dramaturgical Convening in support of their Choreographic Center’s 2018 Fellows. Held on the campus of Jacob’s Pillow in November, this was an extraordinary event of advocacy, scholarship, community, and creativity. It was an honor to be involved. Melanie appears in a new teaser for Transmission: Roots to Branches, a documentary about jazz dance. It’s an honor to be in the company of these dance greats. JAZZ DANCE DIRECT launched on September 27. Melanie was a guest on the Sept 11 episode of The Dance Union podcast, titled Diva Cups and Appropriation. Listen to it here or on your favorite podcatcher. After a successful teaching residency in fall 2017, Melanie is delighted to return to University of Wisconsin-Milwaukee's Peck School of the Arts this year to set a new neo-jazz work on students in the dance program. Melanie is back on the road this fall beginning with a teaching residency at the University of Southern Mississippi. Read Melanie's reflection on David's Neumann/Advanced Beginner Group's residency at Baryshnikov Arts Center on the BAC website. Melanie is featured in the sizzle reel for Transmission: Roots to Branches, a documentary on jazz dance. View it below. To donate to the making of this project visit here. 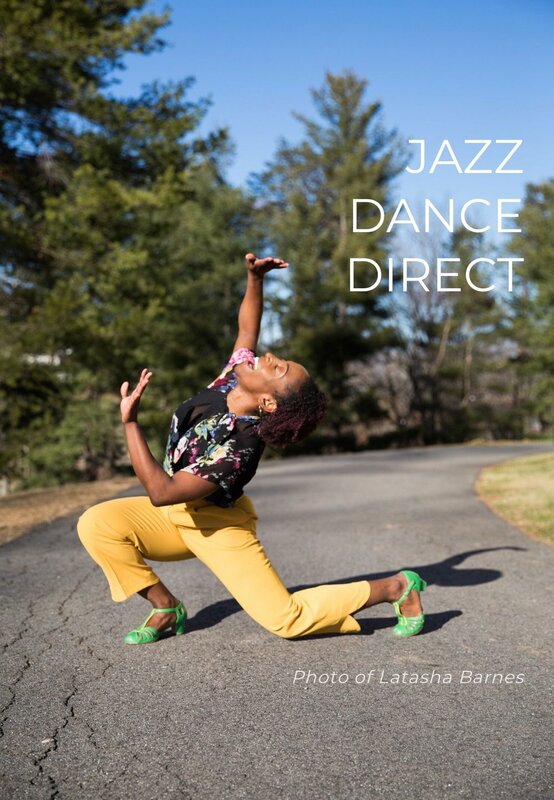 Jazz is... Dance Project has been selected for an artist residency at Wilson College in June 2018. This residency will serve as the inaugural convening of The Woodshed, a meeting of seasoned, like-minded jazz dance artists. During the week-long residency, Jazz Is... artists will be housed on campus and given unlimited access to rehearsal space to stage a Jazz Is... repertory piece and document the neo-jazz aesthetic. Company classes will be open to the Wilson College dance community. Melanie's latest neo-jazz work, Jazz Savory Suite, premiered in April. Created for students at Arizona State University, this performance marks the first time the dance program has included jazz dance in their spring dance concert. Read about the concert here. Hudson Valley's Spectrum News featured Melanie, and Lumberyard Young Performers' classes at the Catskill Community Center, on a recent broadcast. View the video below. In March, Melanie will be interviewed for an upcoming documentary on jazz dance. Directed by Khadifa Wong and produced by Lisa Donmall-Reeve, Transmission will take an immersive look at jazz dance from roots to branches. Learn more about it here. Melanie is the recipient of the 2017 Distinguished Alumni Award from the Western Michigan University Department of Dance. In addition to the award ceremony on October 13, Melanie was in residence for a week teaching classes in neo-jazz and setting a new work on freshmen dance majors. Melanie with WMU College of Fine Arts Dean, Daniel G. Guyette, and Department of Dance Chair, Megan Slayter Jubenville. Melanie, with the cast of her new piece for WMU, and her student rehearsal director, Kelly Anderson. Melanie was interviewed on the Purple House radio program on WGXS radio in Catskill, NY. She spoke to Robert Tomlinson about Lumberyard's new community engagement program, Lumberyard Young Performers. Listen to her interview below. In September, Melanie participated in a roundtable on multiplicity and contemporary dance. Hosted by Anaya Chatterjea and Michelle Steinwald, in Minneapolis, MN, participants included dance scholars, presenters, educators, and journalists. Read more here. Lumberyard is launching two new programs which Melanie will be integrally involved. Read about Lumberyard Young Performers and the organization's partnership with BAM, here and here. Read a blog post about Melanie's work on Raja Feather Kelly's latest production, Another F*cking Warhol Production or Who's Afraid of Andy Warhol, here. Click here to read about one of Melanie's movement clinics at the Lionel Hampton Jazz Festival in Moscow, Idaho. Melanie will be co-facilitating WORK, a 6-day summer intensive laboratory, with Susan Marshall & Company and Pavel Zuštiak (Palissimo), June 19-24, 2017 at Barnard College in New York. Space is limited to 5 choreographers and 20 dancers. Apply here. 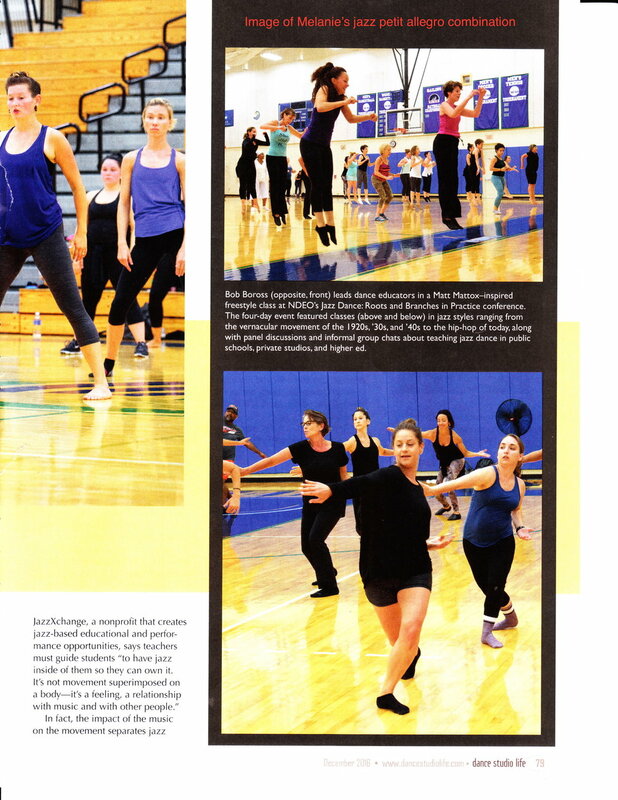 Melanie is featured in an article on the NDEO Special Topics Conference on jazz dance in the December 2016 issue of Dance Studio Life magazine. Click the photo the right to see images from the magazine. PDF article available here. Melanie was an invited master teacher at the National Dance Education Organization's Special Topics Conference Jazz Dance: Roots and Branches In Practice at Salve Regina University in Newport, RI. The 4-day conference blended master classes, panels, and discussion on the past, present and future of jazz dance. Melanie w/ her fellow jazz master teachers (l-r) Moncell Durden, Thom Cobb, Karen Hubbard, Billy Siegenfeld, Bob Boross, Danny Buraczeski, Darwin Prioleau, and Sheron Wray. Melanie received a 2016 Helen Hayes Awards nomination for Outstanding Choreography in a Play for her work on Woolly Mammoth Theatre Company's Women Laughing Alone with Salad.